View from the Birdhouse: Don't you want to keep the neat vintage cards? Don't you want to keep the neat vintage cards? Friends often ask me this question: "Don't you want to keep the neat vintage cards?" The longer I sell vintage items, the fewer items I keep. At a certain point you just have less of a desire to collect. That said -- there are a few special cards that I keep! Usually it is because they have a special interest to me, like a favorite vacation spot or one of my favorite dog breeds. 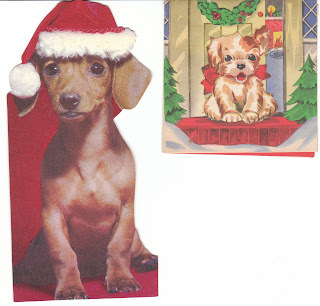 These vintage Christmas cards are a perfect example -- they remind me of my own pups, and they are staying here! The little red Dachshund puppy is so sweet (1960's vintage) and the little Terrier mix is 1940's vintage, and die-cut against a colorful background.